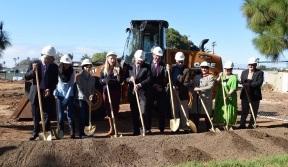 The Groundbreaking Ceremony for the new Imperial Beach Library was held today. 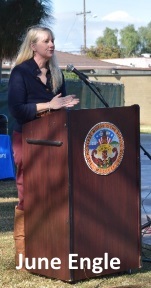 Dignitaries giving speeches included San Diego County Supervisor Greg Cox who was very instrumental in getting the new library in Imperial Beach, Imperial beach Mayor Serge Dedina also spoke along with other officials from the County. Also speaking was Nancy Stone from Friends of IB Library along with June Engle, Branch Manager, who is responsible for running the library and has done an unbelievable job in keeping things running smooth as the library relocated to its temporary home at the Imperial Beach Boys and Girls Club. Said Supervisor Cox, "Libraries are partnerships with the people and are a keystone in building a community". 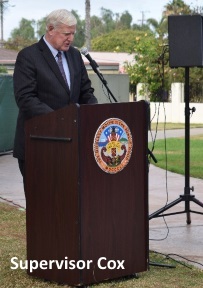 Supervisor Cox also emphasized that the County has built 11 new libraries in the county in the last 11 years! 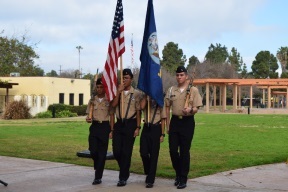 Mayor Dedina, in his speech, emphasized his use of libraries in his youth and that studying three times a week all through college at the library and his growing up in the kids section of the Imperial Beach Library has played a important role in his life. Branch Manager June Engle said being asked to take a job at the Imperial Beach Library "was like winning a lottery.” She loves this community and is excited to break ground today. The new library is an $8.5 million project of the County of San Diego. The new library will be 3 times larger than previous library building. It will have an expanded Community Room for meetings & events, an Outdoor Patio, Computer lab, Teen space, a Bookstore and more. The Building & Design has been done to reflect the Imperial Beach Community. It will have a Wave roof, Lifeguard tower entrance, an old Woodie car inspired children's area, Surfboard styled sidewalks and meet the new Net-Zero Standard. 100% of the power to run facility will comes from solar panels, adaptive lighting & offset. will hopefully a great kickoff to another century of learning for both young and old in Imperial Beach. The New Library is expected to be completed in the Fall of this year!